The Denver Housing Authority is committed to helping vulnerable homeowners avoid displacement. 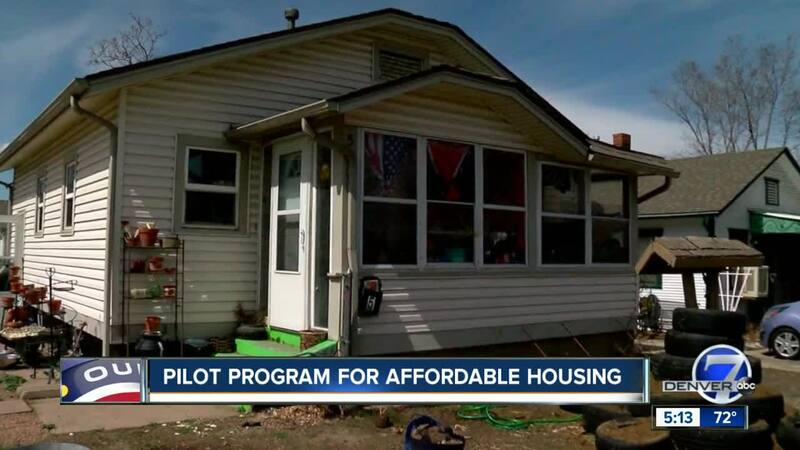 The Authority's West Denver Renaissance Collaborative has launched a pilot program to make sure residents in nine west Denver neighborhoods can benefit from the renaissance underway in that part of the city. DENVER -- The Denver Housing Authority is committed to helping vulnerable homeowners avoid displacement. "Those neighborhoods are having some of the highest challenges with affordability," said DHA Executive Director Ismael Guerrero. "Only 35 percent of existing homeowners and maybe 14 percent of renters can afford to buy new homes in those neighborhoods." The Collaborative's West Denver Single Family Plus Program is targeted toward homeowners in the West Colfax, Sun Valley, Auraria, Lincoln Park, Villa Park, Barnum, West Barnum, Valverde, Westwood and Athmar Park neighborhoods, and will assist them in the development of "accessory dwelling units" to serve as an income-generation and anti-displacement tool. Homeowner Monique Prante is one of several homeowners who initially expressed interest. She purchased her home in the Barnum neighborhood eight years ago for $80,000. Prante, who works in home health care, said in addition to her mortgage, she's paying off school loans and is struggling to keep up. "My mortgage went up another 50 bucks this last month," she said. "My homeowner's insurance goes up. Everything goes up and my paycheck ain't going up." She thought about getting a roommate but decided not to. "When you have one bathroom and they have to go through your bedroom to get to the bathroom, that kind of leaves you in an uncomfortable location," she said. Guerrero said DHA has teamed up with Habitat for Humanity to bring down the cost of design work and construction, so low- to middle-income homeowners can afford to build rental units. The city is giving DHA $500,000 to provide "soft second mortgages" of up to $25,000 to low-income homeowners participating in the program. Kate Hilberg, Habitat's director of real estate development, said they have two architects on staff who came up with the design work for a studio, one bedroom, small two bedroom, large two bedroom and three bedroom unit. She said the community will help build them. She said the accessory dwelling units will be built in modules and will then be put together. She said the first ADU is under construction at Green Mountain High School. Prante learned that she doesn't qualify for the program because her property isn't zoned for it, but she said her mother's and grandmother's properties are zoned for additional dwellings. She said both have applied. Guerrero said the program is targeted toward middle- to lower-income homeowners who currently live in their homes, have properties large enough to accommodate accessory units and are zoned for them. He said the goal is to have 10 ADUs completed this year and 220 over the next five years. "The additional income is what pays for the cost of construction," he said, "And pays for the additional mortgage amount that you may end up with after it's completed." He said it will stabilize existing homeowners and create new rental units. Guerrero said there will be a 25-year covenant, or restriction, on the dwelling unit. "The homeowner would agree to restrict the rent on that accessory dwelling unit to 80 percent of area median income or below," he said. That restriction will be recorded on the deed, so if the homeowner sells the property, the new owner can't jack up the rent. He also said there is a recapture period. If the owner sells the property, DHA can recapture the "lower development (design/build) costs" that allowed the owner to be able to afford construction in the first place.